Tired of checking all pricey foldable electric scooters? Well, this article is for you then. Good news to those who are looking for an affordable option for the foldable electric scooter! No need to burn a hole in your pocket if you are excited to find your first electric scooter. The Pasadena-based electric scooter maker, URB-E, has just introduced the $899 version of its top-of-the-line scooter. This came as a great surprise as the company initially launched its first prototype with a tag price of $1499. Now, it is much easier to make that switch and make your daily commute more fun than usual. Get to know the less expensive version of the URB-E line of scooters – the URB-E Sport. The URB-E Sport is the fourth foldable electric scooter model released by the Calfornia-based manufacturer. The other models boast a maximum speed of 15 miles per hour and can cruise for up to 20 miles of coverage. It was not surprising that with features and the edgy appearance of the other models, the brand name has become one of the fastest growing and increasingly popular one. However, many electric vehicle enthusiasts found the $1499 a bit heavy on the pocket, especially when it comes to a compact scooter. For people who are after convenient urban mobility for the daily commute, achieving good value for money is paramount. With such reaction, URB-E took action and has created a model which may very well go mainstream soon. The more affordable version called the URB-E Sport foldable electric scooter retains the charm of the models that were launched in the past. However, there are some tweaks and improvements which further made this recent model a better option. A top speed and range of 14 miles per hours and 16 miles respectively are certainly a big bonus for riders who wants real value for money. So, what made the price plummet all of a sudden? It is quite simple – the URB-E Sport foldable electric scooter is equipped with a much smaller battery. This is after the manufacturer carried out a study and learned that a number of electric scooter users do not actually make use of the entire 20 miles range coverage. Therefore, replacing it with a smaller one is deemed acceptable and even more practical than the bigger foldable electric scooters. The change in battery capacity also paved way for more features for this foldable electric scooter. For instance, the battery has been made removable. Aside from that, the URB-E Sport now also has additional 4 USB ports plus a Type-C port kind of USB. With the improved connectivity, riders can actually connect their mobile phones or any device to charge while riding the scooter. Within only 40 minutes, you can expect your iPhone to be fully charged while riding your foldable electric scooter. Time for a more fun commuting experience every day. This foldable electric scooter enables riders to enjoy their daily home to work and work to home rides without the need for parking fees or tickets. Most of all, the units are engineered to last. This means that riders can use them for years, without the need to replace the unit every so often. 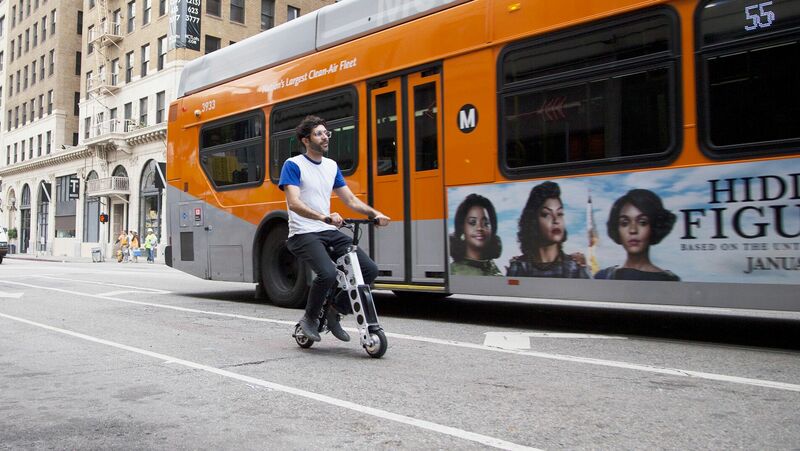 For starter, the main frame and body of all URB-E e-scooters are made from aircraft-grade aluminum and carbon fiber which contributes to the durability and speed of the units. The brushless geared motor that comes in every unit can make riding in a breeze and can aid the rider in powering up hills and sudden turn movements. Compact in size and light in weight, this foldable electric scooter is truly a must-have for all types of commuters. URB-E understands that there is no one-size-fits-all design to accommodate all types of riders. With that, it has allowed some space for flexibility and creativity. You can customize your unit by adding your desired accessories. Some prefer adding an extra storage so a basket can be added. Others are more comfortable with an installed bell. For more tech-savvy riders, a Bluetooth speaker can likewise be added. Whatever you need or want, you can have included in your unit. It’s not just all about function, but this foldable electric scooter is designed to provide utmost comfort to its riders. With the ergonomically designed and padded seat, the URB-E Sport allows users to maximize their riding experience while navigating through the jungle of urbanized and suburban communities. In addition, the anodized handlebars are completely retractable, so you won’t have to worry about space problems as the whole electric scooter can fit anywhere and can be stored anywhere. The design is also one of its advantages as you can enjoy the striking colors and the sleek design that would inevitably suit your style. Each unit also comes with a leather strap that has been built in to allow portability. You can carry it while on the metro, take it in the office, or even at the coffee shop. One thing is certain – this foldable electric scooter is built to last and to give you the best riding experience. Whether you are cruising on a flat surface or a rough road, you are guaranteed to enjoy a smooth ride thanks to its 8” pneumatic tires that never go flat. The whole unit only weighs a minimal 30 lbs, making it one of the lightest and most compact electric vehicles ever built. Moreover, you can fold the unit in merely half a second. Yes – 0.5 second is all you need to fold it back again so you could carry it inside your home or the office. The quick folding capacity enables you to enjoy using this foldable electric scooter without having to worry where to park it. To top it all, new owners are also provided with a one year warranty. The URB-E Sport enables you to enjoy using an efficient and practical foldable electric scooter without breaking your bank. However, if you have an extra few hundred of dollars to spare, you can give the other URB-E models a try as well. For instance, the URB-E Sport GT is also one of the ultra light foldable electric scooters you can try that has a built-in Eddy power source. This model has been designed with push-rod suspension system that is based on the racing car’s design. You can have this e-scooter either in Guards Red or Stealth Black color. The URB-E Pro is also one of the best electric scooters you can find on the market today. The frame is made from aircraft-grade extruded aluminum and the handlebars are produced from carbon fiber materials. The tires are 2 inches bigger than the URB-E Sport and the rear mounted brushless motor produces 350 watts of power. In addition, this PRO model has a built in coil over shock suspension system. The battery power enables the riders to enjoy a maximum range of 20 miles. With superb connectivity and a top speed of 8 miles per hour, this foldable electric scooter is certainly one of the electric vehicles worth investing in. Another foldable electric scooter you should check out is the URB-E Pro GT. Weighing only 35 lbs, this tiny road beast can take you as far as 20 miles even at a speed of 18 miles per hour. This is highly recommended for the true adventurous riders as its motor can help them speed through all types of terrains. The connectivity, portability, and performance are certainly the best reasons to give this ride a try as well. URB-E is sending a clear message here – whether you have the money to splurge or limited dollars to invest in an electric vehicle, they certainly have the best foldable electric scooter for you.